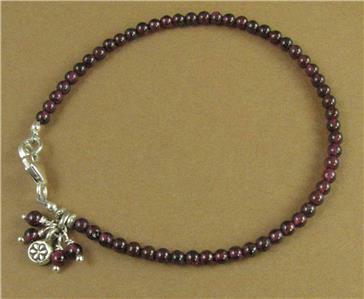 Home › Bracelets › Red garnet bracelet with dangles and charm. Fine and sterling silver. 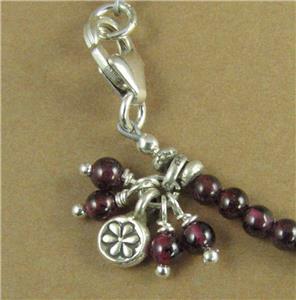 Red garnet bracelet with dangles and charm. Fine and sterling silver. 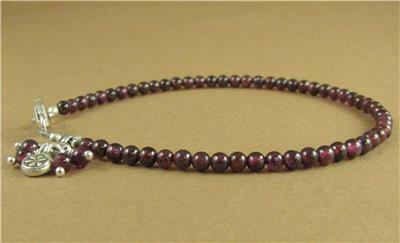 This is a red garnet bracelet with dangles. The stones are natural red garnet. The catch and the small charm are extremely pure solid fine silver (98%). The wire inside the dangles is solid sterling silver (92.5%). 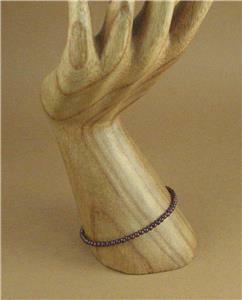 The wire I have used inside the bracelet is both flexible and extremely strong. The red garnet beads are 3mm across. 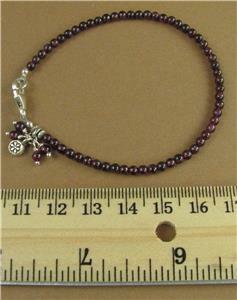 The length of the bracelet is 7.25 ". I can alter the length if needed. I am the designer of this bracelet and I have put it together with my own hands. I have been making my living exclusively from designing and making jewellery for 9 years. I travel every year to seek out old and tribal silver from Asia and India along with semi-precious stones. Back at home in Brighton, England, I make these loose pieces up into beautiful and unusual jewellery.